Sticks to existing clothing label with no sewing or ironing required! Avaiable with black, red, Magenta, Royal Blue and green lettering on White Labels. 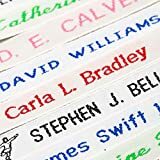 Traditional Woven Sew-on Name Tapes - Quick Delivery! 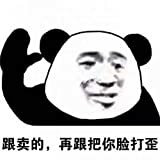 Material: The tags are made of 300 GSM paper card. Size: 3.5'' x 1.7'' / 9cm x 4.5cm ( L x W ). 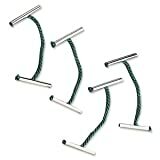 The twine is 100 feet / 30 meters long, you can cut freely according to the length you need. 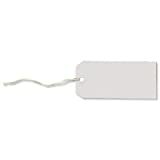 These blank tags are ideal for stamp hang tags, price tags or even product description labels tag. 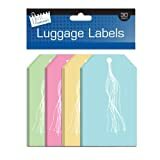 Great as wedding favor tags, birthday gift tags, baby shower favor tags,or other celebration favor cards. 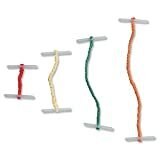 They also can be used as gift tag, confetti, scrapbooking embellishment, cupcake toppers,handmade cards, cardboard labels or any other DIY craft projects. Size: 10 cm x 5 cm . Approximately 1.96 inches wide by 3.94 inches long. 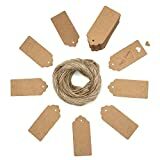 The jute twine is 30 meters / 100 feet long , durable and multi-purpose for DIY projects. 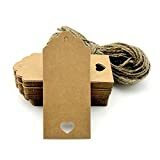 The tags are sturdy, made from high quality kraft "Craft" card and They come with a reinforced pre-punched hole with a twine (30 meter long) attached. 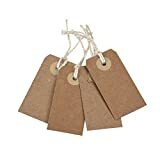 The high quality kraft paper label tags are great as message tags, thank you notes, bookmarks, gift tags, clothing tags, price tags, mason jar tags, Christmas gift tags, baby shower birthday favor tags, festival gift card, or other place name cards. Paper gift tag size: 2.36"*2.36" (6.0*6.0cm). 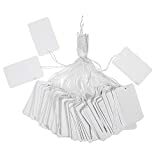 The paper tags is vintage and durable, you can write the words you want on the blank area. 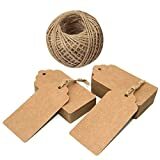 Come with 100 feet / 30 meters jute string, you can cut freely according to the length, durable and multi-purpose for DIY projects. 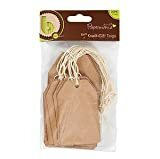 Great for kinds of different holidays, and perfect to add a unique touch to gift boxes, gift bags, party favors, handmade soap, baking cookies, cupcake wrappers and toppers, mason jars, wine bottles, and more. 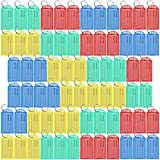 Wide application: these hanging tags are widely applied for identifying and arranging various items, labeling party favors, marking household objects, decorating craft projects, etc. Colourfast lettering. Irritation free soft woven edges. Wide range of colours, fonts and motifs to choose from. Woven on our own looms the next working day. To preview and submit your details click on the Customise Now button. 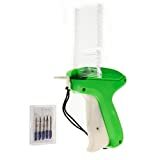 This tagging gun for clothes is easy to use and reload. It works fast and efficient. The insertion needle is sturdy enough. Includes a safety cap to protect the needle when not in use. 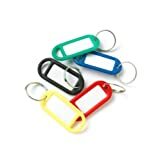 This clothes tag gun is absolutely brilliant for labeling a variety of price tags, tickets and tags to a wide range of garments, socks, hats, trousers and other soft fabrics. Material: plastic. 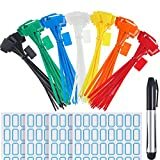 Safe needle cover and wrist strap. Suitable for DIY cards, luggage labels, greeting card, gift card, message, Christmas cards, bookmarks, etc. Suitable for DIY cards, luggage labels, greeting card, gift card, message, Christmas cards, bookmarks,etc. ENTER NAME TO BE WOVEN IN THE CUSTOMISATION BOX - High Quality traditional woven nametapes can be sewn on to any type of garment or accessory. High quality 100% Polyester yarn used throughout, superb weave quality and the colours are permanent and non fade. Woven nametapes do take longer to manufacture - we aim to post within 3 working days but please allow 5 working days delivery during back to school and busier times. HATE SEWING?? 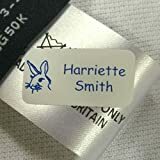 - Then check out our listing for Pin-Tag Rivets - These easy to use stud system for attaching woven labels to garments will save you hours of sewing time. 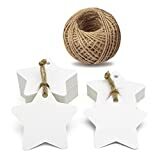 ★Gift Tag Material: High-quality kraft paper with moderate thickness, 1.96 x 3.93 inches, nice and sturdy, absorb the ink well without bleeding and not easy to break. 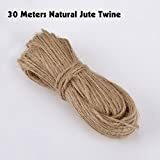 ★Natural Twine: The string is natrual jute twine with free 100 feet,you can cut freely according to the length, which is made from natural materials, environmentally friendly and non irritating smell. 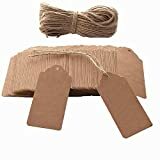 ★Resealable Package: 120ct gift tags and 100 feet jute twine in a re-sealable box, keep fresh and re-use! 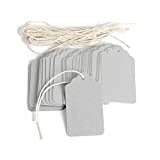 ★Blank on Both Sides: The vintage blank tags are perfect for price tags, gift tags, clothing tags, wedding name tags, student words cards, bookmarks tags, cupcake toppers, wish trees, thank you notes, love notes, scrapbooking etc. In particular, They are stunning wedding favor that you will be proud to present to your guests. Home handmade, Arts and crafts must-have! 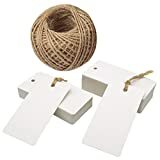 ★Satisfaction Guaranteed: We are confident you will love our BakeBaking Gift Tags set, You can be confident in buying it as we offer you a 7 days money back guarantee! Keeping you happy is our priority.